I have finally finished a long overdue update of my Black Mountain in Rancho Bernardo trail guide. It can take quite a bit of work to get to all of the trails in this area so it took several visits. I had forgotten just how easy to rack up a bunch of the elevation gain out at this place. There has been some nice working going out here. The new Lilac trail is a great addition to the place and Miners Ridge Loop is in great shape. The revised guide includes routes that use the Nighthawk connector which adds some additional options for getting up to the peak of the mountain. So if you have not been to it in a while it is well worth it give the place another look if you call the San Diego area home. This past weekend Nichol and I rode a modified version of the Cuyamaca Grand Loop. It is very much looking like spring up in the Cuyamaca Mountains with lots of greenery, blooming plants and wildflowers. We started off from the East Mesa staging and rode the singletrack up to the park headquarters and then took the Green Valley Fireroad north. Instead of climing Soapstone grade. We took the Upper Green Valley singletrack north and climbed out of Cuyamaca State Park and into the Anza Borrego Desert State Park to the La Cima trail. You are certainly not in the desert at this point but the cool thing about the topology here is that in less that four miles the Cuyamaca Mountains drop nearly 3,000 feet into the desert proper. We topped out on the La Cima trail at about 4,880 feet. We rode the La Cima trail west to the California Riding and Hiking Trail (CRHT) where we the turned south. This section of the CRHT is really sweet with some great views of the grassland of the Lake Cuyamaca Basin area. This section of the CRHT is about 2.5 miles long and about halfway through this section you leave Anza Borrego State Park and cross back into Cuyamaca State Park. The trail connects back up with Soapstone Grade fireroad at the top of the grade and we continued along the Grand Loop rout to the east. In years past the state park had the California Riding and Hiking Trail closed to bikes in virtually all sections that were singletrack. They have sense changed there mindset (Thanks to some tireless advocacy work by SDMBA!) and many more sections of the CRHT are now open in the park. Instead of taking the pavement from Soapstone Grade Road out to Hwy 79 (I think the pavement is called Stonewall Creek Road?? ), We took the CRHT singletrack. 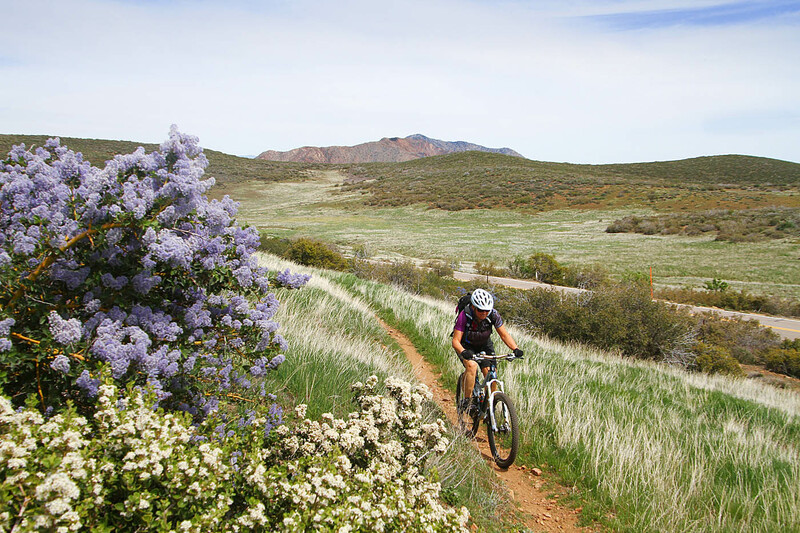 The CRHT uses sections of the Minshall, Los Vaqueros and Vern Whitaker trails. These are some nice sections of singletrack. They do undulate a handful of times that is going to add your day’s effort but I put the cardio costs well worth it to enjoy these trails. The CRHT comes out less than 50 yards south of the where the pavement meets up with Hwy 79. There is also a junction with the northern end of the Cold Stream Trail. The original plan was to turn right and continue along the Grand Loop route and do Milk Ranch Road and maybe a climb up Middle Peak. Considering how cool the last section of the CRHT was and the open to bike signs for the next section across the highway, we opted to continue along the CRHT. We immediately noticed that next section saw far less travel that across the highway. Most of the users are obviously following the road to the north or the Cold Stream trail to the south. I dig riding on trails that are sometimes defined by matted down grass. There was also some rocky technical bits that added some nice character to the trail. At the Azalea Glen trail junction the CRHT become make off-limits to bikes. This was disappointing and turn west to ride the Azalea Glenn Loop trail which is open to bikes. This lead us to the Paseo Picaho Campground. We wanted to get up on the Azalea Fire Road and Fern Flat Fire Road to close off the Grand Loop but we now had to cover quite of elevation over a shorter distance. A grunting we would up Lookout Road. Once we made it up to Fern Flat fire road we turn south and enjoy some mighty long stretches of downhill cruising that took us back down to the West Side single track near the start of the ride. All together it was 22.1 miles with 3,190 feet of climbing so we definitely earned the post-ride beers and BBQ and Alpine Beer Company. This weekend I got up at O-damn early and I traveled up to the Los Angeles area to catch up with an old friend. What better way to catch up on things than during a bike ride. After swinging by his place we continued northward to spend some time on the Golden Eagle Trail. What a nice chunk of trail. The lower portion of the trail was scorched by a wildfire in the last couple of years but the recovery process is well underway. The climb was a good punch to the cardio system. The two McDonalds sausage biscuits that I had just recently polished off for breakfast and were now sitting like a couple of bricks in my gut also helped with the challenge. I should know better by now, clearly I’m a slow learner. Sausage sweats aside, once we got a little further up on Liebre Mountain we cleared the burn area and things got back to how I remembered them. (Both for my stomach and the trail!) There are some seriously nice ribbons on dirt on this mountain with incredible flow across both grassy hillsides and through forests of oak trees. After tooling around on the Liebre Mountain ridgelines the descent down the Golden Eagle trail was quite a rip. It was the awesome kind of situation where all your sensory systems are fully engaged to help produce the required muscle/body action and your brain seems to shift from conscious controlling to supervising. That wonderful state of being fully in the moment. While I did not notice it on the climb, the fire damage near the bottom had made the usable trail’s usable tread even narrower than normal in spots which required some high speed precision in spots. It was a great day to be on a bike. I’ll be tweaking the route description on my page in the coming days to reflect my latest understanding of the place. 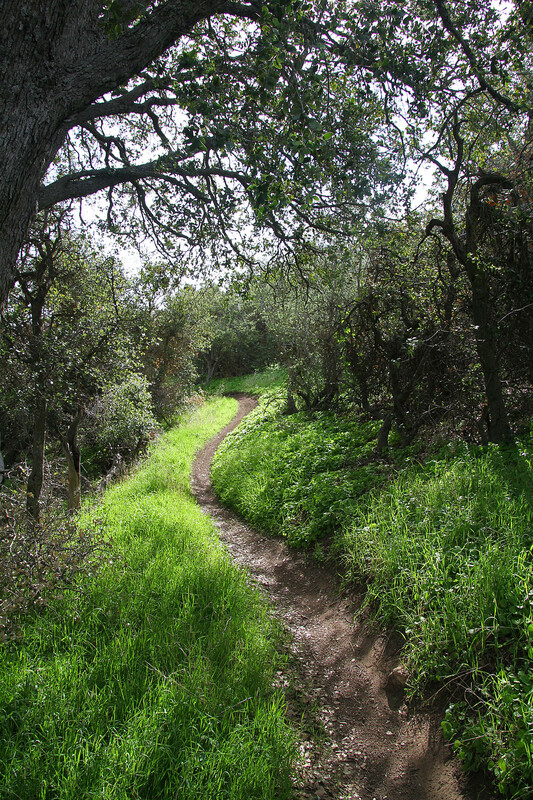 It has been long overdue, but I have finally updated my Los Penasquitos page to reflect the current configuration of trails in the area. Yes, it does include the Tunnels area. More from a trail inventory perspective than a go ride it endorsement. Although, if those trails were legal I would highly endorse them. But it is not legal to ride those single tracks to I won’t endorse riding those really awesome trails. I also included the miles of mostly shaded single track along Penasquitos Creek. These are trails that provide a quality outdoor experience that are also off-limits to bikes. While the best stuff out at Penasquitos is off limits to bikes, there is still plenty of miles of dirt to get yourself in a good workout here. You can read more about it on the updated page. I spent a couple of afternoons this past week getting reacquainted with Black Mountain in near Rancho Bernardo. The Lilac Canyon trail has recently been rerouted and it is way much for the better. The trail still starts from the Miner’s Ridge Loop trailhead but now instead of steeply descending down to Carmel Valley Road it down contours along the north slope of Black Mountain around to the glider port. Shortly before the trail reaches the glider port a single track forks off to the north and pass under Carmel Valley Road. This is another nice section of singletrack that works its way around to the north side of the Black Mountain Ranch Park (baseball fields). This provides a direct connection to the Santa Luz/Larsardi Creek Loop. This is a really nice trail connection that I’m stoked about. I’ll be updating my site soon with new data on the trail. I had kinda lost my appreciation for just how much climbing there is at Black Mountain. The first ride out here I did about 17 miles and 2,500 miles and on the second ride I did 16.75 miles and 3,000 feet of climbing. It seems mighty early for the rattlers to be out and about already but this fellow above was the third rattler I have seen this year. I came around a turn and I was at that distance where I had to decide wither to bunny hop the snake or throw out the anchor. I chose to throw out the anchor and ended up pulling off a totally awesome nose wheelie stop that I’m positive I could not pull off again if I tried. The Miner’s Ridge Loop is in fantastic shape right now with the rain we had the previous week. If you have not been out here in a while you should go check it out while the greenery of spring is in full effect.